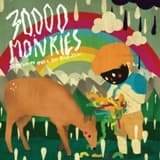 30,000 Monkies are an experimental stoner noise quartet from Beringen, Belgium. Their sonority is described as experimental not because the band tries to merge a wide variety of sounds and textures in order to create something awkward, but due to their non-linear approach to song structures and sounds that brings to mind a noisier version of Melvins jamming with Flaming Lips. Their first EP Womb Eater Wife Beater released in 2011, showcased the band blending the sludgy heaviness of bands like Melvins and Harvey Milk with elements of psychedelia and noise-rock. For their newest EP, Somewhere Over The Painbow, they have opted to offer a more straightforward version of their aesthetic, but still retain a bit of their experimental edge by launching into some weirdo riffing and sounds throughout these four new tracks.